This is an officially licensed Disney Fairies product. Leave your worries behind while soaring in the sky with mesmerizing Tinkerbell. Girls always want a charming and sprightly themed costume for parties so Tinkerbell attire fits perfectly in this purpose. 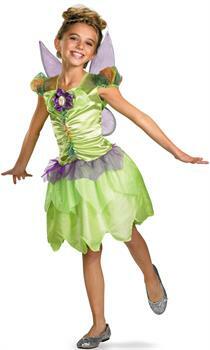 How about Disney fairy costume with magical feeling? If you want to travel to Neverland then go for Tinkerbell outfit. Little babies deserve to dress up in amazing cute costumes. We got perfect cuddly costumes for little kids. You might explore more costumes but you will definitely fall in love with our Disney Fairies - Tinker Bell Rainbow Classic Toddler / Child costume.